Most gardens offer us sensory treats: a profusion of flowering perennials and annuals; the rustle and movement of wind in the trees; splashing water features; whimsical or formal statuary; pathways and benches—all vying for attention. Some are divas in the garden, insisting on attention. Groundcovers are garden understudies, bringing unity and a sense of order to the landscape in an understated way. 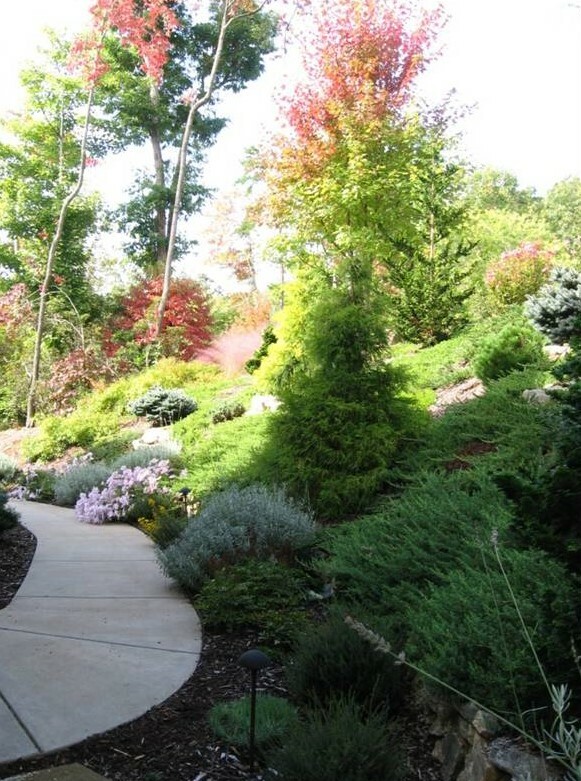 They can provide a carpet of color linking ornamental plants, or create different moods as plant choices shift throughout the garden. Groundcovers are perennial plants intended to cover an area for many years. Groundcovers can be evergreen or deciduous, blooming or not, woody or herbaceous. Generally, groundcovers are short plants, growing 18 inches or less. Turf grass is a common groundcover, but lawns are costly, requiring fertilizer, lime, water, and time-consuming maintenance. They are unsuitable for steep slopes and shady areas. There are many attractive alternatives! Consider how much more interesting fragrant groundcovers such as Sarcococca spp. (sweet box) and Gallium odoratum (sweet woodruff) would be than turf grass! Or how much more practical edible groundcovers such as culinary thyme, oregano, and strawberries would be than inedible lawn! Some groundcovers love full sun—Phlox subulata (creeping phlox) and low growing juniper (Juniperus spp. ), among others. Other groundcovers prefer shade—Chrysogonum virginianum (green and gold) and Tiarella (foam flower). Moss will thrive in the dense shade that defeats other plants. Groundcovers have so many excellent properties that it’s amazing they are often an afterthought in garden design. They are a useful, lovely answer to the question of what to plant on a steep slope. Visualize a garden with an underlaying grand sweep of a green groundcover. Then picture the same garden with bare earth or mulch. The garden with groundcover will seem fuller and more complete as compared with the starkness of the garden without. Groundcovers are indeed a quiet delight in the garden. Article written by Sally Wheeler, Extension Master GardenerSM Volunteer. Over the next several weeks, our blogs will highlight a variety of groundcovers—those that attract pollinators, very low-growers, sun-lovers, and those that thrive in shade. There’s a groundcover to fit any landscape. NOTE: BEWARE of INVASIVES and very aggressive plants listed in this article, such as English ivy, nandina, and periwinkle.